I don’t know about the rest of you, but here in upper Indiana, we’ve had a VERY late spring. It’s FINALLY gotten warmer and the trees are flowering. And that means that I’ve been spending a bit more time outdoors…weeding. Yep. That glorious task. Weeding. It’s rewarding, but definitely hard work and often pretty dirty work. So I haven’t been sewing quite as much yet. But I did start pulling out fabrics for my project for Ayumi’s Book Sew Along. And I found a fabric that grabbed me and said “use me!”. But not for Ayumi’s projects. For a project for my Caitlyn. A budding Ballerina. 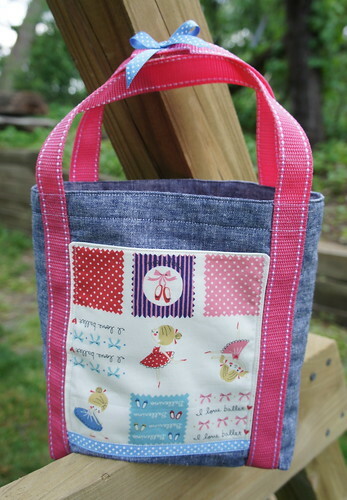 I made this little lined tote bag for a tiny ballerina just getting ready to start lessons this summer. This mama KNOWS that her daughter will love being a ballerina. The girl already has some great moves without a single lesson and prances around all the time. lol Plus she has a good sense of rhythm and pitch (which makes me happy because I’m a singer and my dad happy because he’s a drummer). So music is in her genes (and I haven’t even gotten started on her father’s side and all the musical talent there). I used a pre-made purchased pink webbing for the handles. They wrap completely around the bag. I’ve been wanting to try that style for a long time. I didn’t follow any particular pattern but merely looked at a lot of pictures of bags I wanted to try and figured it out as I went. I’m NOT a natural bag maker, but it’s good to push that 3 dimensional thinking for me every once in a while. 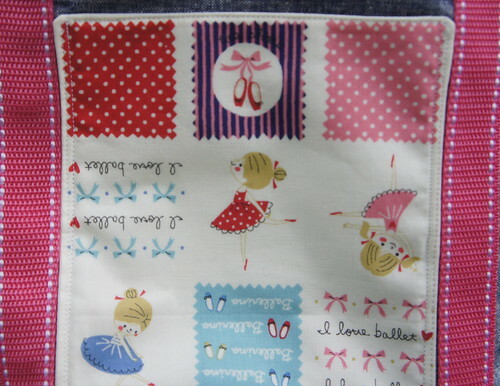 I had one 10″ x 10″ piece of this ballet fabric and I knew that it needed to be a pocket detail on the tote bag. It’s just darling. It was hard to cut into but it’s always good to use even a piece of fabric rather than just letting it lay in your stash. Oh I could just eat that fabric, it’s so cute. It’s a Kokka Japanese print for anyone looking. It actually comes in a few colorways, so find the one you love. The Body of the bag is made from an Essex Linen in Demin from Robert Kaufman. I added a light fusible interfacing to give it some body. 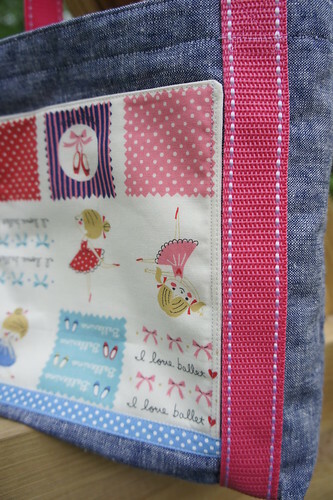 The lining is a pink polka dot from someone…can’t remember. Riley Blake maybe? I’ve had it a LONG time. So happy to finally use some of it! A box pleated, lined tote for the little ballerina in my house. She loves it and can’t wait to start her lessons. Don’t worry. I’ll take pictures of her in her little leotard, tights and shoes once we have them. 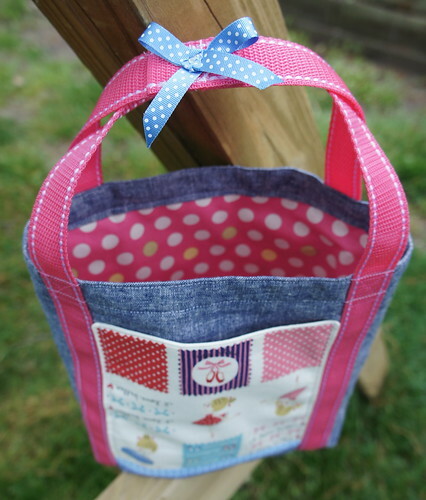 She’s going to be uber cute…especially with her special tote bag just her size for her shoes. What a fine job you did sewing a bag right off the cuff! Darling. I think fabric.com might have that print on clearance right now. I've been wanting to buy some . . . but there's the issue of having three boys (only). This is lovely. You did a fantastic job. I did something similar when our girl was little. Only she did Polynesian dancing. So I drew from the Hawaii fabrics. She is now 25, but still has the bags and clothes that where made. A very fond memory for her. And yes she is super musical also.